The best thing that this film has going for it is the title. 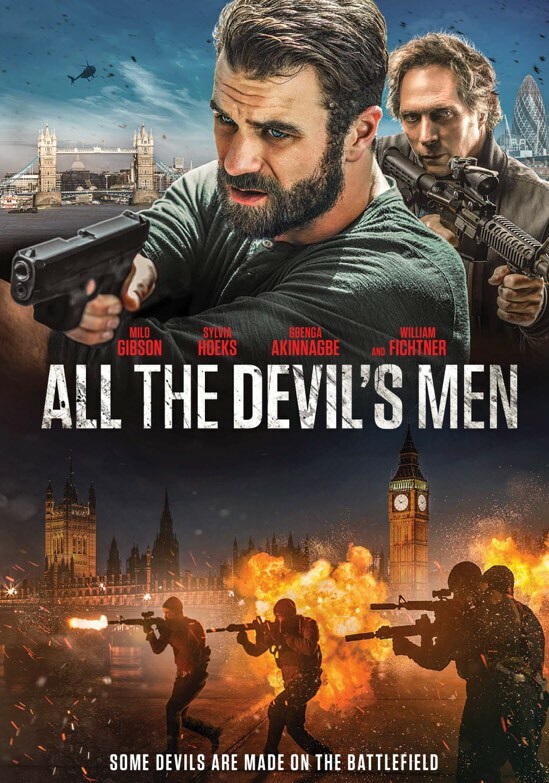 All The Devil's Men is the sort of title befitting a big budget International spy thriller. While this film checks off some of those boxes, it is anything but big budget. The problem with All The Devil's Men is mostly one of fatigue. We have seen this movie a dozen times over this year and it's only February. It seems that secondary titles are currently obsessed with CIA agents and rogue spies. Call it the Mission: Impossible effect if you will, but until those films stop making hundreds of millions of dollars at the box office, we will be drowning from a glut of low-budget knockoffs. 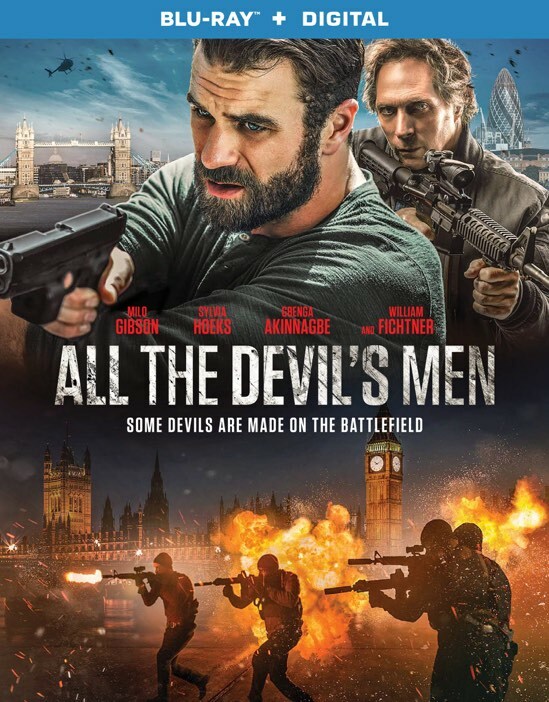 All The Devil's Men follows a team of hardened military operatives who are recruited by the CIA for a black op to track down a former agent who has turned. He is pursuing a nuclear warhead and this team must erase him before he gets his hands on the nuke and starts World War III. Sound familiar? If you got a scary sense of deja vu watching that trailer, it probably stemmed from the lead actor Milo Gibson. Yes, he would be the son of Mel Gibson and the resemblance is a bit striking, although the young Gibson is a bit bulkier than his old man. Looks aside, he seems to lack his father's charisma onscreen which is a tall task given that Mel in his prime was one of the most striking actors in Hollywood, able to carry films across a wide spectrum of genres. It seems that Milo and his physique is well suited for this action/spy genre, but without much personality, his character is basically a cardboard cutout of every other PTSD modern war veteran and the movie suffers. There are subtle hints in the film to a backstory involving a family back in the States, but instead of engaging that plot point, the filmmakers decide to frolic in bullets and explosions instead. The only problem as we mentioned at the beginning of the review is that this film has been done time and time again by better actors and better filmmakers. In fact, practically the only redeeming quality is the film's title which sadly the film does a disservice to it by being so bland and vanilla. The film wants to be an international spy thriller, but it's obvious that the lack of resources severely hampered the vision of All The Devil's Men. The majority of the film is set in London, but there is little to no establishing shots and all of the action is shot in ambiguous locales that could have just as easily been Kansas City as London. I get that you're wanting to save money, but you do have to spend a little to get a bit payoff and this film just continually avoids spending money. Where the majority of the film's budget did go towards though is the relentless shootouts. Most of them are boring and lackluster, but one or two actually turn out to be high points of the film. The film's script certainly doesn't help to cover up any onscreen blemishes, so the better the action sequences, the better in my opinion. The one absolute delight in the film is the always phenomenal William Fichtner. He is a consummate character actor that doesn't get nearly enough due for bringing his weight to bear on films that otherwise would be lost without him. His performance isn't enough to save All The Devil's Men alone, but the film is infinitely better when he's onscreen than when he's off it. To me, the biggest detriment to the film is the lack of originality. I've seen this film time and again over the last few years and it would take something uniquely original for me to stand up and applaud an international spy traitor thriller. There are nuggets in All The Devil's Men that gave me brief hope, but just when you thought it might make a sharp turn to something interesting, it opted instead to play it safe and kill people. I get it. There's a reason that these type of films pop up every other week and that is that people get an inherent enjoyment out of simple, mindless violence. A simple moral play with guns engages a very sizeable audience, it's just one that I don't find myself gravitating towards all that often. Is it really that crazy to expect more than the same old cliché spy action sequences that we see over and over again ad nauseum? I don't think so and I hope to be pleasantly surprised some day. Again your mileage may vary on All The Devil's Men as there is a sizeable audience that really enjoys these types of films. If you simply want to park your brain and watch 100 minutes of bad dialog and questions gun exchanges, then All The Devil's Men may be for you. All The Devil's Men is now available on DVD and Blu-ray.